Hollins is situated in beautiful Roanoke, Virginia, a vibrant city that offers an abundance of fun and entertaining activities that appeal to every interest. Students enjoy the city’s many festivals, unique shopping, excellent restaurants, outdoor recreation, and wide range of area attractions. Hollins University is located on U.S. Route 11, just off Interstate 81 at Exit 146. Our address for GPS and online map sites is 7916 Williamson Road. Take Exit 146, turn left onto Plantation Road, go approximately one mile and turn left onto Williamson Road (Route 11 north), go approximately 1/2 mile, turn left into the campus entrance. Take Exit 146, turn right onto Plantation Road, go approximately one mile and turn left onto Williamson Road (Route 11 north), go approximately 1/2 mile, turn left into the campus entrance. Turn right on Hershberger Road, take I-581 north for 2.6 miles until it intersects with I-81 north, bear right and take Exit 146, turn right onto Plantation Road, go approximately one mile and turn left onto Williamson Road (Route 11 north), go approximately 1/2 mile, turn left into the campus entrance. 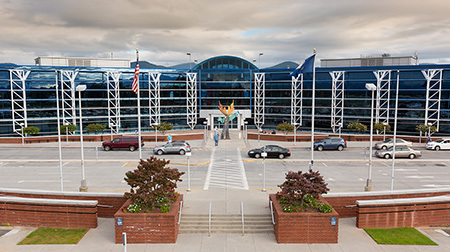 The Roanoke-Blacksburg Regional Airport is only a 10-minute drive from campus. The airport is served by American Airlines, United Airlines, and Delta. Take Route 220 north until it runs into I-581 north. Travel 5.4 miles on I-581 until it intersects with I-81 north, take Exit 146, turn right onto Plantation Road, go approximately one mile and turn left onto Williamson Road (Route 11 north), go approximately 1/2 mile, turn left into the campus entrance. (Route 220 south), take Route 220 south until it intersects with Route 11, turn right at the stoplight and follow Route 11 for 3.5 miles, turn right into the campus entrance. (Route 460 west), turn right onto Alternate 220 and travel approximately 5 miles to the intersection of Alternate 220 and Route 11, turn left at the stoplight and travel south on Route 11 for 3.5 miles, turn right into the campus entrance.